“Your customer is your most powerful asset” according to Harvard Business School Professor Frances Frei. Yet, how many organisations actually manage and monitor their customers as a financial asset? 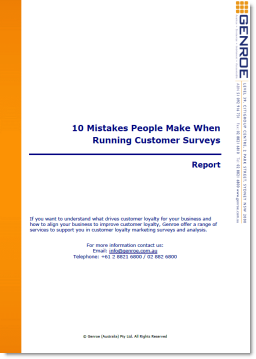 This may come as a surprise but implementing customer feedback is not about sending out surveys. It’s not even about collecting data. It’s about something much more. The National Business Growth Summit is a two-Day executive event for entrepreneurs and leaders of growing companies. It is being held in Sydney on the 6th and 7th of March 2013. The Growth Summit first ran in 2012 and had such great reviews that it is being run again in 2013. This year speakers include Verne Harnish, among other things, author of Mastering the Rockefeller Habits, eminent social media guru Jay Baer and John Warrillow, author of Built to Sell.